Hydro Tech’s diligent performance of the Phase I ESA discovered that the local phone directory (Yellow Pages) associated the site with a dry cleaner. Other sources such as the RCRA generator database, a site inspection (site was vacant), and other historical information did not provide this information. The Phase I ESA concluded the historical utilization of the Site as a dry cleaner should be considered a Recognized Environmental Condition (REC) and a Phase II ESI was recommended. During the Phase II ESI levels of chlorinated solvents from the former dry cleaner were identified in the soil and the groundwater. With this knowledge, Hydro Tech successfully applied the project to the New York State Department of Environmental Conservation (NYSDEC) Brownfield Cleanup Program (BCP). 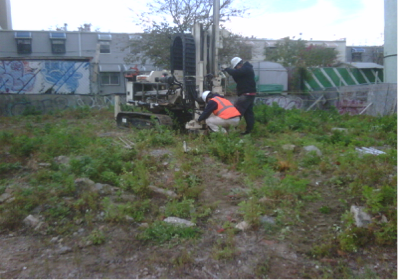 Hydro Tech installed and sampled over 20 monitoring wells and soil probes during this investigation. The monitoring wells were installed at different depths to determine the vertical migration of the chlorinated solvents. Based upon the results, appropriate reports were prepared and submitted to the NYSDEC. Hydro Tech then consulted the prospective purchaser on their options of navigating the BCP program, met with state and local officials and presented results to board members.